Use the arrow buttons to move the silver ball. The goal of the game is to stay inside the grey box. 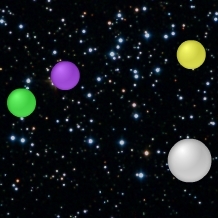 The coloured balls will appear over time and try to knock you out. Good luck and have fun. The player should use the keyboard arrow keys to move the frog and jump on the stone in horizontally or vertically. When the frog jumps from one stone to another the stone will disappear. When all the stones disappear you will move to the next level. This love story of two people, Max and Michele to whom you will help will meet pushing aside obstacles in their way.